The research contributing to the guidelines involved several stages, each of which emerged as a logical progression from the previous stage. The research was informed by literature in the following areas: assessment and feedback; pedagogic guides containing advice for designing assessments; cognitive load theory; instructional text design, information processing; educational psychology; teaching methodology; linguistics and discourse analysis. 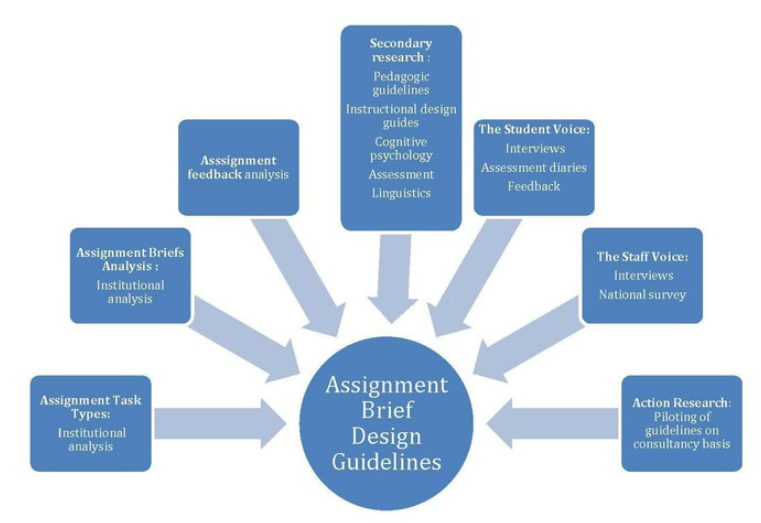 Initially, an inductive analysis of 120 briefs was conducted to determine the frequency and nature of the written assignment text types required. The most significant finding to emerge from this was that over 20% of the briefs were not explicit about either the required task text types or their expected features. There were also a number of briefs which were unclear or inconsistent about other requirements. This led to a preliminary analysis to identify and collate general effective and less effective communicative features of briefs. This initial assignment briefs analysis yielded a range of effective and less effective features, the most salient among the latter being a low level of explicitness. This raised the possibility that the written brief itself might have to depend on other means to communicate instructions fully. Therefore, using the same assignment briefs, an analysis of the assessment criteria and the feedback on a sample of submitted assignments was undertaken. The aim was to determine whether the feedback was consistent with and supplementary to requirements and expectations as expressed in the brief and embodied in the assessment criteria. The core outcome of this investigation was that there remained, to some extent, a number of requirements and expectations that were not explicit or were not consistently referred to. An analysis of specific questions on the communication of assignment requirements in student experience surveys and of student audio diaries on assessment was carried out. Semi-structured interviews were conducted with a range of students. Participants were asked to select one effective and one less effective assignment brief and then interviewed on features that contributed to the briefs’ effectiveness in communicating requirements and expectations. No direction was provided as to what might constitute an effective or less effective feature. Students highlighted and discussed, with great insight, a range of features. These were tallied, compared to the previous research findings and an initial prioritisation and categorisation of features was compiled. The assignment brief design and delivery process was also investigated from the staff perspective. Structured interviews with lecturers were conducted by student researchers in the University of Huddersfield. These explored staff perceptions of writing assignment briefs. Findings informed the design of a survey on designing assignment briefs and communicating assignment requirements, distributed across the HE sector. The outcomes of these two research areas, coupled with the findings of the previous research further informed the development of a draft set of assignment brief design guidelines. These were then piloted and evaluated. A trial assignment brief consultancy service was then set up in Oxford Brookes University. Staff members were invited to submit their assignment brief and, applying the guidelines, the communicative features of the brief were commented on and priority areas to work on provided. The experience in and feedback from the trial consultancy facilitated the final development of these assignment brief design guidelines.